The designs in the Or Nué Series are all very basic, beginner designs. There are some wonderful websites that give information about this technique, and I encourage you to check them out. The history of this technique is quite fascinating! Or Nué is French for “Shaded Gold”. 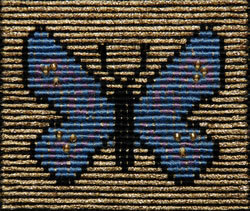 Gold threads are covered with couching threads which create the design. Fabulous Chameleon space dyed threads from South Africa are used for the couching which creates a truly unique piece while incorporating the traditional Carolina Lily quilt pattern. Another great design for using your stash of threads! Worked on black 18 count canvas. Approximate finished size of the design is 3” x 4”. Or Nué is French for shaded gold. 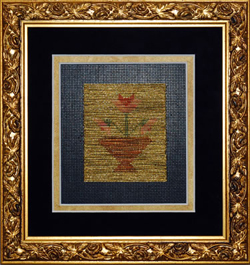 Silk threads are couched over gold metallic, with the couching creating the design. This is a great design for beginners. It is also very easy to change colors to use what is in your stash. Another beginner design that is great for using your stash of silks. This design continues the Or Nué series. You’ll find that Or Nué can be quite addictive and is a wonderful way to use your stash of threads. 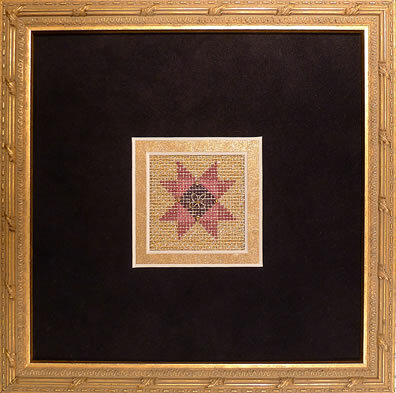 The Star Lily is another quilt pattern with beautiful splashes of color. 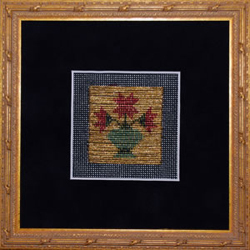 Gold threads are covered with couching threads which create the design. Worked on black 18 count mono canvas. Approximate finished size of the design is 2” x 2”. 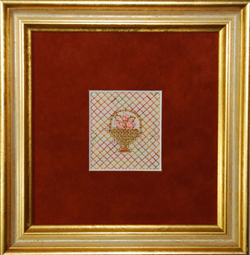 Another Or Nué Design that gives you a "taste" of the technique without the investment of real gold threads. Switch out the gold and try silver metallics. Use threads from your stash to create a beautiful butterfly that will brighten cold winter days by reminding you of summer! Approximate finished size of the design is 2" x 2". 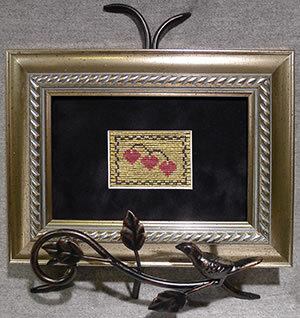 This diminutive design is a delightfully fun piece to stitch. 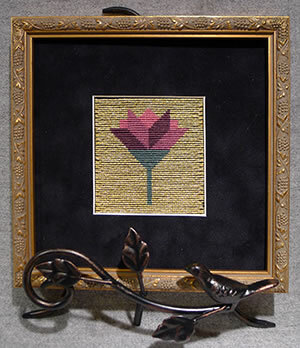 Chameleon space dyed threads from South Africa, and silk ribbon embroidery are combined with gold metallics. They’re small enough to make several for Mother’s Day. Change the colors and create some Christmas ornaments. They’re also great for using all your stash threads! Learn this medieval technique while creating a tiny egg ornament. 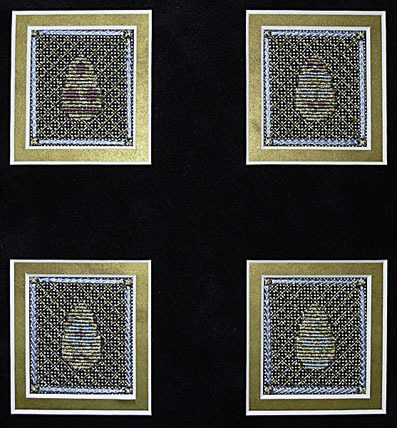 Four different designs are included in the book. 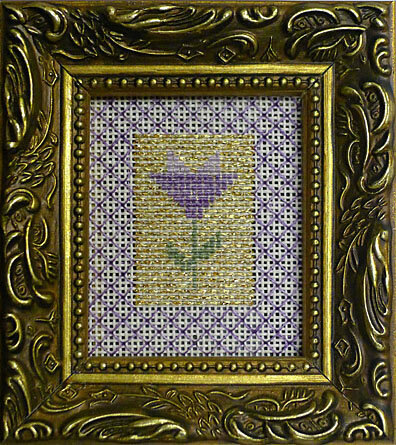 This is a very basic beginner design that is great for workshops and using your stash of threads. 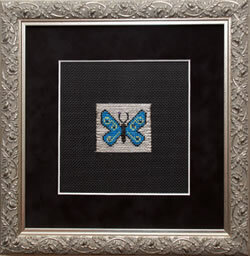 Approximate finished size of the designs when stitched on 18 count canvas is 1.5” x 2”. Or Nué for the beginner! Use silks from your stash to couch gold metallic. Model was stitched in shades of lavender, but feel creative and choose your own colors, just remember that bright colors work best!